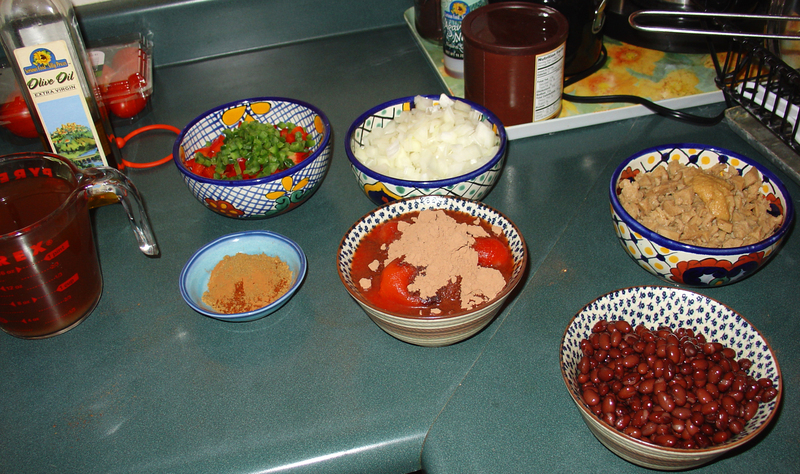 Twice so far, I have cooked Chili Sin Carne Al Mole from Vegan With a Vengeance. This stuff is amazing. AMAZING. It is so incredibly delicious. It has bits of chewy seitan, hearty beans (I used black instead of pinto as the recipe called for), sweet tomatoes, spicy jalapeño, and, of course, cocoa powder. It took me - no exaggeration - about an hour and a half to chop, measure, and divide this all up. So, despite the fact that it took me an eon and a half to prepare the ingredients, that’s all my fault, and not the fault of the ingredients or the recipe. Up there in the picture, I have everything divided out so that I could just dump it in the pot when it was time. First, I have the red peppers and jalapeño, next I have the onions. After that I added the spices from the small blue dish. Next came the seitan and garlic. (I, as always, am lazy and use garlic-in-a-jar). Finally came the tomatoes and cocoa. I ended with the vegetable broth and the beans. After just simmering for a while (and letting it sit so that the flavors meld) I had an amazingly delicious vat of mole sauce filled with seitan, beans, and some vegetables. 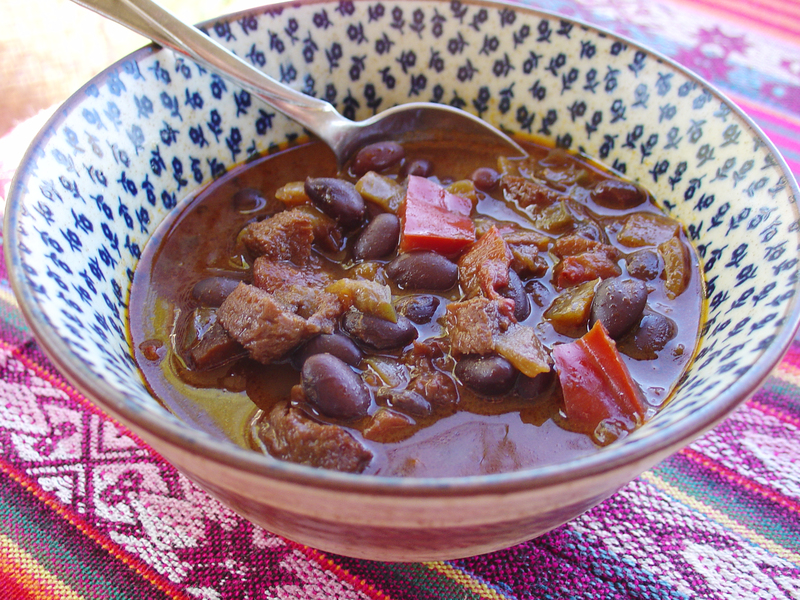 A delicious bowl of chili sin carne al mole. I usually post small photos on here, but this deserved a full-sized viewing. 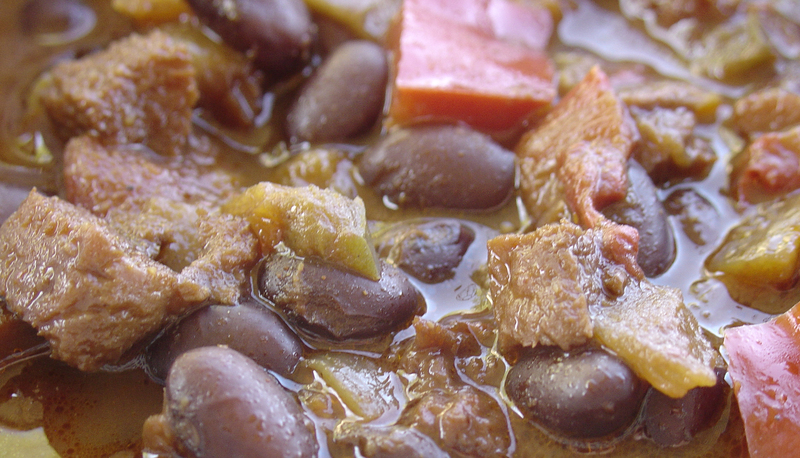 You can see chewy chunks of seitan, hearty black beans, onions, red peppers, jalapeño peppers, chunks of tomato, and a sweet brownish-red broth of veggie stock, tomato, spices, and cocoa. I just ate a bowl of this stuff, and already my mouth is watering looking at this picture.